Anyone who has ever stayed at a resort or taken a cruise discovers a truism: By the time you’ve figured everything out, it’s time to go home. After all, new experiences often have steep learning curves. Having recently spent a week on the Viking Torgil as it sailed through the scenic Douro Valley (the area of Portugal famous for its wines, olive and olive oils, and almonds), we wanted to pay it forward and share some tips we learned along the way. The Viking Torgil and its mirror-image “sister” ship, the Viking Hemming, were both custom engineered to meet the navigational requirements of the Douro River. Because they are shorter in length and have fewer passengers (106 instead of 190) than conventional longships, they’ve been nicknamed, “baby longships. Thus, these tips for cruising on the Viking Torgil will also be useful for passengers on the Viking Hemming—and, perhaps, even be applicable to some other land or sea adventures. Cruise attire is more relaxed and informal than ever before. Although some passengers on river cruises still opt to “dress up” (dressy slacks, or a skirt or dress) for dinner, others transition into evening in the same clothes they wore during the day. Very few men on our cruise wore blazers to dinner. Secret #1: Don’t over-pack and resist the temptation to bring things you’ll never use. Secret #2: Most important is to have a pair of comfortable walking shoes because you’ll be traversing many cobblestone or unpaved streets on your trip. It’s prudent to have another comfortable pair to wear onboard. Secret #3: Pack layers because the California-esque temperatures of the Douro Valley often start off cool in the morning, turn warmer during the day, and get chilly again at night. Secret #4: Ladies, bring a cross-over shoulder bag to wear when you’re touring crowded cities like Porto or Lisbon. Unfortunately, no large city anywhere in the world is free of pickpockets. In fact, it’s best to leave valuables in your in-cabin safe. Secret #5: Bring suntan lotion but leave any fragrances at home. There are often flying insects along the riverbanks and you don’t want to be a magnet for bugs or wasps. One of our pet peeves when traveling is there are never a sufficient number of hangers in closets. We poked our heads out the door of our cabin and our steward resolved this problem in an instant. Secret #6: You’re apt to settle in far more quickly if you request an extra dozen or so hangers at the onset of the cruise. Secret #7: Totally unpack your belongings when you arrive in your cabin. There is ample space to stow everything (empty suitcases under the bed). Your cruise will be more comfortable and relaxed when your “stuff” is organized. All the cabins on the Viking Torgil have an abundance of task and overhead lighting with multiple switches on the walls and beside the beds—all placed at eye-level. The lighting framing the bathroom mirror is friendly for over-50 travelers, too. Yet, when it’s time for lights out, it can be confusing to remember which switch controls what set of lights. Secret #8: Use the key card beside the door. It is a master control for all electricity in the room, including air conditioning. When you are ready for bed, lift the card out and all the lights will turn off. Place it back in and only your air-conditioning will be restored. Secret#9: The cabin is outfitted with multiple electrical outlets for both European and American appliances. If you tend to be a very heavy electronics user (e.g. phones, iPad, laptops, digital cameras, etc. ), bring along a power strip so you can charge all your devices at once. There is no charge for connecting to the Internet while onboard. In fact, once you sign on, you won’t have to sign on again. Your connection will work in public spaces as well your cabin. Secret #10: Keep your expectations in check. On any cruise, satellite coverage can be spotty, especially as you go through locks on the river. Table options in the dining room range from tables for 2 to tables for 10. They all circle a large buffet table (used during breakfast and lunch only), making for a convivial ambiance. No tables may be reserved in advance. Depending on your preference, you can sit at a small table, meet new friends at a larger one, or mix it up for different meals. Secret #11: Two small dining rooms are hidden behind the glass doors at the back of the dining room (they are marked Al Fresco) on both sides of the vessel. Although they appear to be set-aside for something special, guests may use them at lunch or dinner. Want some time alone to soak in the river views with less dinner conversation? Just ask the Maître d’ to be seated there when you enter. Need a banana a day to keep up your potassium levels? Follow a gluten-free diet? Have other food requirements, sensitivities, aversions, allergies, or cravings? Don’t see it on the buffet table or on the menu? Secret #12: Viking does a great job of accommodating even the pickiest of eaters. Don’t hesitate to ask your server about something that isn’t on the menu. (I overheard one passenger at breakfast request that the Chef prepare a chocolate soufflé for dinner and saw it at the guest’s table that evening.) Of course, be reasonable. We were delighted to discover that the entire crew of the Viking Torgil was of Portuguese descent, proud ambassadors of their land and culture. (This is rarely the case on most ships.) While the crew is multi-lingual, well-trained and gracious, some combinations of diner/server personalities may mesh better than others. Secret #13: Each server in the dining room is assigned a specific group of tables in a section of the room for the length of the cruise. If you sit in the same area for all your meals, your server will begin to anticipate your food preferences (e.g. Do you like your morning coffee as soon as you sit down in your chair or prefer it after you’ve had some breakfast? Do you prefer tea with milk?) We fell in love with our waiter but if you don’t, vote with your feet and sit at a table on the other side of the room. Don’t let anyone tell you that river cruises are inactive. Au contraire. Each day will be filled with stimulating excursions and onboard programming. Secret #14: While it’s tempting to do it all, remember you can set your own pace. After all, you are on vacation. You can skip a particular excursion (even though it’s included in the price of your cruise) or stay on the vessel all day while most passengers are away. You’ll feel like you are on a personal yacht when you make use of the sundeck or, weather permitting, take a dip in the pool. Secret #15: A nice library is tucked in one corner of the lounge that has an array of reading materials, including books and guides about the Douro Valley and other areas of Portugal. Many of the excursions on the Douro River itinerary entail bus rides to small towns rich with history and culture that are tucked into hillsides. Viking uses new, comfortable, air-conditioned buses with wide windows that allow you to photograph, or simply soak in, the stunning scenery. Secret #16: If you use your cell phone for photography, you may need to juice up on the bus. Electrical outlets are conveniently located below the seats. Bring along an electrical plug adapter (U.S. to European) so you’ll be able to stay fully charged. Secret #18: If you are jetlagged or short on shut-eye, you can look forward to taking a nap on the bus. The lounge is a great place to relax, chat with fellow passengers, and enjoy passing vineyard views along the shores. It’s also where the ship’s Program Director gives valuable but succinct daily briefings about the next day’s activities. Secret #19: The lounge is right-sized and almost every passenger is likely to be in attendance for the briefings. So get there a few minutes early to choose where you want to sit. Similarly, if you want your choice of seat on the bus, be prepared to disembark as soon as you hear the announcement saying that buses are available for boarding. Secret #20: Cruisers always seem to find a special place to soak in the sun or read a book. If you want to relax outdoors, take advantage of the intimate deck with seating and tables outside the lounge, called the Aquavit Terrace, which will protect you from the wind. It shouldn’t be a secret but be sure to read the itinerary-specific information booklet that is sent to your home before your departure. River cruising is such a hassle-free way to travel, that it’s easy to take that for granted. Along with our little secrets, Viking Cruises does an excellent job providing all the information you need to have a wonderful cruise! 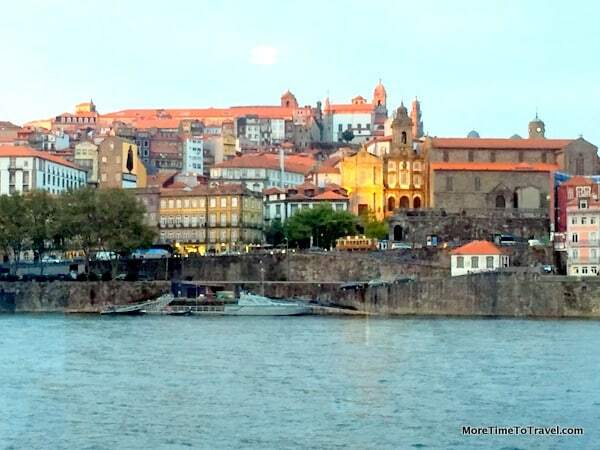 Disclosure: We were guests on Viking River Cruises’ River of Gold voyage on the Viking Torgil in Portugal but any opinions expressed in this post are our own. These are fabulous tips. I must go on what sounds like a wonderful trip! “Baby longships” – cute :-). That’s a good tip about asking for extra coat hangers. We too asked our room steward for extra hangers on our recent Viking Baltic cruise. It makes all the difference, especially on a 14-day cruise, to be able to put things away properly. We loved our ocean cruise – it sounds like Viking does just as good a job at their river cruises. We’ll have to try one some day :-). I’m hoping to try a Viking River Cruise! Great hints, and a post I will come back to again when we do a cruise. I was wondering how it is nowadays on a river cruise. We\’d love to join the river cruise on the Douro River. It\’s such a diverse tour. Your tips are very useful. Hope you get to use these tips soon! Really enjoyed your post and think it’s about time I did a river cruise. LOVE how the outlets cover all country adapters and that there’s one on the bus! Looks like this river cruise has everything covered. Your photo of the vintage suitcases came in handy in this post! Looking forward to reading more about Portugal, which I hope to travel to over the New Year! We cruised the Danube on the Viking Freya and these tips apply to our longship as well. Viking is such a wonderful way to experience a river cruise. We’ve sailed the Danube on the Freya, too. It’s hard to choose one cruise over another because they all offer so many great ports and excursions! I’m glad that the tips resonated with you! I appreciate all the information. I’m taking this cruise in April; very timely for me!! You make so many excellent points and offer so many great hints…thank you!! As veterans of five Viking trips, and loved every one of them, we heartily agree with all of these tips. We haven’t been on a baby longship yet, hope we get to soon. Taking a power strip is a good tip (for a hotel as well as a cruise ship) – I always seem to run out of places to charge everything up! Bringing one with us has always served us well—on land and at sea! Wonderful tips Irene! Viking does such a great job taking care of every detail. We really enjoyed the library when we went on their Danube cruise. It included terrific recipe and culinary books with regional information. It was a wonderful resource!